You know the drill. Fly into Lima, then from Lima to Cusco. Take the train to Machu Picchu, one of the 7 New Wonders of the World. Well, definitely do that…but also do this: check into a hotel that resides on the side of a cliff. 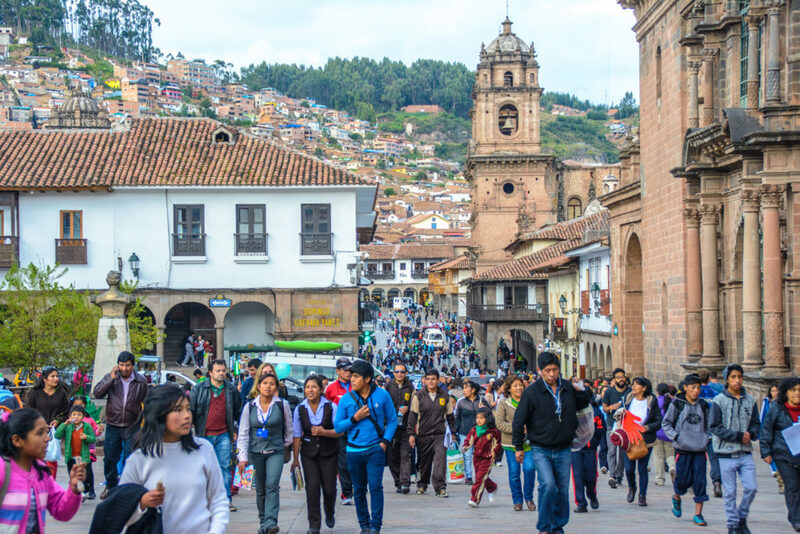 You may be the only person on the flight to Cusco who isn’t heading to Machu Picchu, but being different is a good thing. We left our bags behind in Cusco and began our two-hour drive north. Up until this point, I hadn’t had a lot of time to think about this climb, this night on the side of a cliff. We’d been traveling nonstop for well over a month now, and my camera and I were tired. There’s no telling how many photos I’d taken up to that point, but we needed to recharge. And fast. The world’s only Million Star Hotel was about to demand its close up. We arrived to the base of a mountain around 3:45pm. Only a small shed was in sight with some equipment and attached zipline cables. A man came out and introduced himself as Guillermo. He’d be our guide until the next morning when we’d make the decent. I immediately liked Guillermo – funny, patient, bilingual…we were going to get along just fine. Groups typically go straight into the climb upon arrival. Mother Nature decided to give us a little shower upon ours, so we tried waiting it out, but we all grew impatient. Heading into the rain, our wolf pack of four (Guillermo, Wade, me and Misha from Boston, a solo traveler) began the climb after a short safety talk. This was already more intense than I’d bargained for. I remember stepping on to that first rung with shaky legs. They were never shaky, never wavering. AH OH. Get it together, guys. Around that time, we had to turn on our headlamps. That’s when it really sunk in. What the hell am I even doing right now? It’s damn near pitch black dark, and I’m on the side of a cliff in the rain. This should end well. And it did. It ended very well. We arrived to our capsule around 7pm that evening and had a few minutes to check out or transparent capsule before Guillermo was back with a gourmet dinner. King bed, check. Two twin beds, check. Bathroom, check. View, check. Sold! It didn’t take long for Guillermo to hike back with our dinner complete with soup, salad, and quinoa with chicken. OH and I can’t forget the brownie. That dinner may have placed in the top three as best meals in South America. AND I WAS ON THE SIDE OF A MOUNTAIN. How is that even possible?! Mind officially blown. We were 1200 ft high in a transparent pod, dangling on the side of a rock face and yet, sleep came easy that night. The king bed was equipped with heavy down comforters and was honestly one of the most comfortable beds I’ve ever had the pleasure of sleeping in. As you probably guessed, there’s no heat or A/C up here, so just be sure to bring along a change of clothes as well as your significant other for body heat and companionship if you decide to commit to the climb. This needs to be shared with someone special. And someone who’s not afraid of heights! I can hear the question now, “But where do you go to the bathroom? !” Fear not. Just behind a zipped compartment lies a secret land of toilet, sink, fresh water, towels, and the best bathroom view one could ask for. Ladies – I have some strange news for you. Y’all will have to pee into a bowl that’s set inside the toilet, and then essentially pour it down a makeshift urinal. It’s actually not as complicated or scary as it may sound. This needs to happen because Natura Vive created a solid and a liquid system so that guests could (almost) use the bathroom like normal while taking the utmost care of the environment. Everybody wins. What comes with sleeping in a transparent pod on the side of a mountain? An early AF wake-up call! I didn’t even mind that the sun woke us up at 5:30am. Christmas morning vibes were all up in that capsule. Because we arrived at dark the night before, this was our first chance to really see just how high/crazy we really were. The shock wore off after a few minutes, and we broke out the GoPro, the Osmo and the Nikon for some crazy photo/video sessions before hiking down to breakfast a little after 7am. The experience thus far was insane, sure, but nothing beat hiking down a few feet to Guillermo’s pod for breakfast. The spread was incredible – coffee, orange juice, fresh fruit, granola, ham, cheese, bread, jam, SCRAMBLED EGGS. I’m sorry, what? Yeah, when you’re above the clouds perched on a cliff in the Sacred Valley eating scrambled eggs, you really begin to wonder how things can get any better than in that precise moment. It’s all downhill from here. After the remainder of the eggs got cold and we’d taken our millionth photo of Peru in front of us, we began the journey down. We weren’t hiking, walking, trekking or biking. There’s no 1,200 ft water slide around these parts, either. No elevator, no helicopter. We attached ourselves to six different ziplines in order to make it down to ground zero. Talk about an adventure! I don’t think I’ve ever had so much exhilaration packed into an 18 hour period, ever. If you’re in Cusco and have a night to spare, you know what to do. We got lucky and were able to snag the last opening Natura Vive had the entire month, so book in advance! The only night available at the Skylodge Adventure Suites during all of April was the night before we were supposed to arrive to Cusco. LAN Airlines did it again and went above and beyond in order to make this stay possible. Special thank you, LAN! What an unbelievable experience! Talk about an epic breakfast with an epic view! This one is going on the bucket list, for sure. I will be doing this next Friday! I’m terrified and excited all at the same time. Ah! Thanks for sharing and wish me luck! Ekkkkk! You’re going to LOVE it! Have a blast. how much was it per night? $320? and did you have to make reservations far in advance? Yes, $320/night per person. We made the reservation only a few weeks in advance. They only had one night open for that entire month, and it just so happened to be a night that we could work with! Wow!! We saw this on the side of the mountain from the train after Machu Picchu. But I don’t think I could stay there, eeeeek!!! This is seriously so awesome! Def going to add it to my bucket list. Thanks for the idea, Leslie! Amazing! I’m heading to Peru in August for 2 1/2 weeks, saw this place but it was already booked up for the time I’m there…so I guess it gives me a reason to head back next year! This is a major bucket list item for me! My friend and I are planning on doing this in September. We will be traveling from Chicago with beginner hiking/climbing experience. Do you recommend we stay a few nights in Cusco or possibly going to Macchu Picchu first because of the altitude? And what do you recommend we wear? How did they get all that hot fresh food up there?